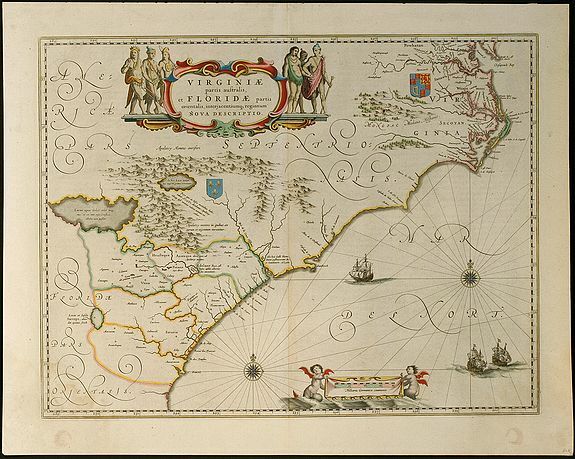 Virginiae Partis australis, et Floridae Partis Orientalis, interjacentiumq, regionum Nova Descripti - BLAEU, W.J. Title : Virginiae Partis australis, et Floridae Partis Orientalis, interjacentiumq, regionum Nova Descripti. Size : 15.2 x 19.7 inches. / 38.5 x 50.0 cm. Description :Attractive map of the east coast of Virginia and Florida. Second state with small tail at left water-cherub. "One of the many elegantly engraved maps of the Eastern seaboard of North America published by Blaeu or Jansson which influenced other cartographers for most of the seventeenth century." (Antique Maps - Moreland & Bannister, p. 256). Condition : Lower corners slightly water stained up to the illustration, reverse some old tape from former framing. Otherwise perfect condition.